Details relating to the Portuguese Commemorative of 2016. 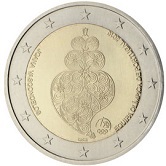 The coin celebrates Portugal’s participation in the Olympic games of 2016 in Rio de Janiero. In the inner ring a “Viana-Heart*” is shown. It was created by the artist Joana Vasconcelos (whose name is seen on the edge of the inner circle – eight to ten o’clock) and represents a spirit of determination and passion which are seen as typical of the Portugese people and particularly of their athletes who went to Rio. On the right edge of the inner ring is the inscription “EQUIPA OLIMPICA DE PORTUGAL 2016” – Portugese Olympic Team 2016. Around five o’clock the five Olympic rings can be seen. At the bottom is the mint mark “INCM”. · * The Viana Heart is typical of traditional jewelry art in the North of Portugal.